July | 2015 | ISE-HAKUSAN DOU'S "THE UNIVERSE"
You are the result of a baton of life having been passed narrowly. As the cost of graves has been increasing, it might be difficult for ordinary people to get a new one. When I die, I’d like my family to dispose of my ashes at a crematory and just make a black wooden memorial tablet with the golden words “THE PLACE FOR ANCESTRAL SPIRITS OF SO AND SO FAMILY” written on it, instead of a Tanzaku, a short strip of paper. And I’ve been telling my family to write the year of my death, my age, my name and my simple personal history in a notebook made from Japanese paper as a necrology and put it beside the memorial tablet. My family wants to buy a small grave, though. These things should be left to fortune or karma and are nothing you worry about. Holding memorial services has a really deep meaning. Tracing back to your ancestors, you can reach the origin of human beings ultimately. You can never stop at your own ancestors only. If you keep on holding memorial services for your ancestors with “gratitude for being kept alive” being the key, the memorial service becomes the one for all human beings and things and a paean to great nature. If you’re in this state of mind, you wouldn’t care if your memorial service is effective or not. You’ll find yourself holding it just because you cannot help feeling grateful for your existence. When you’re worried about the effectiveness of your memorial service, you must be thinking at heart “I did it for you, so what can I get in return?”expecting some profit. If you’re so, you won’t be able to keep on doing it. If your memorial services do have effect on your ancestral spirits, you can keep on doing it naturally. On the other hand, if your memorial services don’t have any effect on them, you’ll stop doing it somehow. We’re living now. But living things die easily. Just a simple carelessness can cost you your life. It is “you”, living now, that the result of a baton of life like a fragile, easy to disappear tightrope, having been passed from ancestor to ancestor. What are you complain about? You must not take a picture of the main sanctuary of a shrine from the front. When I was a child, a lot of special TV programs were broadcast featuring spiritual phenomena during summer holidays. Most of them were usually broadcast from 12:00 to 15:00. Thinking back now, I’m surprised that television stations in the 1970s to 80s would often broadcast such strange programs in broad daylight. Not scary stories but ghost photographs were most popular in those programs. There was a famous commentator named Mr.N in those days. I thought as a boy that the man who was wearing sunglasses of a pale color was somewhat gloomy. Frankly speaking, I didn’t like him. Though I was an elementary school child, I knew how dangerous such ghost photographs were and if or not they were authentic. Many of them were fake, but some were real ones. I still remember what Mr.N commented in a TV program. One of the ghost photographs introduced there was the one of a small shrine in a dark cave. Diagonally upward in the photograph, there was a big face of Hannya（般若）, a female demon with two horns on her forehead, smiling faintly. I trembled to see the face. I felt it was not funny. After taking the photo, according to the letter from the contributor of the photo, one of his family members was killed in a car accident and the other members became sickly. When the anchor person of the TV program asked Mr.N for some comments about the picture, he said frightened “Please forgive me about this picture. I can’t say anything about it.” Then the anchorman said with a disquieting expression “Say something, please. This is a TV show! ” This program was being broadcast live. “If I say anything about this, I’ll be killed, too” he said and shut his mouth. Then a TV commercial cut in abruptly, and when the show resumed, the subject had been changed to another picture. Remembering this situation, I’ve found that he had a lot of experiences related to ghost photographs. He must have had terrible experiences after he assessed the same kind of pictures. Remembering this photo, I’ve found that this is a shinto shrine in a cave where Kukai（空海）confined an evil, spiritually strong being. Kukai would often confine evil spiritual beings in shrines around the country on condition that he enshrined them as deities. It’s a kind of condition for exchange with evil deities. These shrines appear to be ordinary ones. So ordinary people have no idea whether or not they are right places to pray and apt to think there must be good deities there because their names are deities’. Unfortunately, spiritual beings have existed who eat human souls since ancient times. It is one thing to try to depend on deities regarding them as motherly and it is another to respect them. If you take a picture in front of the main sanctuaryo of a shrine, you will get a pictures with some spiritual being in it because Kenzokushins（眷属神） protect holy spirits there. They have no human feelings nor compassion. Once they start to move, they try to accomplish their missions by all means like a machine. They don’t pay respect to human souls. When you visit a shrine where holy spirits exist, you may hear a sound of buzzing. I have heard this sound before while I was praying at the sanctuary building of Geku（外宮）of Ise Grand Shrine. This sound resembles that of big bees very much. Kenzoku-shins（眷属神）protect shrines connected to holy spirits. When ordinary psychics who call themselves “professionals” response to some spirit at a shrine, they are usually responding to this Kenzoku-shin. Most of them think mistakenly that they responded to the main deity of the shrine. To be sure, Kenzoku-shins belonging to a shrine are related to the main deity because Kenzoku-shins are part of the deity, but most ordinary psychics are mistaken. It can be said that spiritual beings are a body of vibrating magnetism. Wandering spirits can emit an unpleasant, noisy sound like a broken TV. Low-frequency buzzing sound of a high-voltage line or a large transformer resembles the sound spiritual bodies emit. You cannot hear the sound of high-ranked spirits because the sound is too subtle to hear. Spiritual beings going off the sound of buzzing are dangerous in a sense. Because they have strong, practical power that affects the World of Reality, they can bring both retribution and happiness. They will divine protection to those who offer gratitude to the main deity. As an interesting episode, I had an opportunity a long time ago to talk to a man engaged in mission work of Ohmoto-kyo（大本教）, a Japanese new religon, when the religious group was at the highest of its prosperity. Disciples of Deguchi Onisaburo (出口王仁三郎）were travelling the country at that time who were entitled to do its mission work by him and also had enough spiritual knowledge and power. The man was very old when I met him. He had already left the group, so I could hear a lot of secret stories from him. According to him, having been able to gain new believers at a local place, he invited Mr. Deguchi to come to a large hall to preach. Then if there was a bee coming into the hall, Mr. Deguchi would often stop taking and leave the hall with indecent haste, which happened many times. He looked so afraid of the bee. There is a deep meaning in this incident which is related to the spiritual being behind him and the local deity. That is, Mr.Deguchi was expelled by the local holy spirit. Anyway, it’s interesting that there exist creatures in nature giving off the same sound as that of holy spirits. Bees make honey combs composed of hexagonal cells. Crests of shrines are often hexagonal. Bees are messengers of God. What is the right response to true deities? Visitting Izougu（伊雑宮）in Ise, whose official name is Izawanomiya, people will feel various things individually. Rare plants or creatures inhabit the small sacred place strangely as if it has kept the environment since ancient times. Holy energy body of Amaterasuohomikami（天照太御神）, or the supreme spirit on this planet, exists there miraculously. I’ll explain the right response to this energy body in order from high-level response to low-level. 1. You feel maternal love as if you had felt it before. You see nothing unusual. You’re surrounded rightly by the holy energy of Amaterasuohomikami, which I call the best response, grade 10. 2. Putting your hands together, you can see a vermilion thing like the sun disc. You’re seeing the form of the holy energy, which is the response of grade 9. 3. You see a figure of an ancient person. It’s difficult to judge whether or not this response is right or wrong because when you see some concrete figure, you often see your own spiritual dirt. Even if the figure is the one of the holy spirit, the rank of the response is down to 5. 4. You hear a voice like that of God and your body begins to move unconsciously. This is a bad response. Out of the question. Your spiritual dirt is just appearing. I recommend that you purify the spiritual dirt by holding memorial services for your ancestors. Reading comments of the readers of this blog who have visited Izougu, I see that they had a right response. This is because they know well that offering gratitude is the most important when they visit shrines to pray to deities. This is great. Whichever shrine you visit, this is important. As long as you offer gratitude, even evil spirits can never relate themselves to you. Well, most pay psychics who call themselves “mentor” experience the response of No.4 mentioned above, No 3 at best. Such an experience is no big deal. Most of the readers have experienced much better responses to the holy spirit. In this world there are a lot of people who have devoted to such a mentor their money, precious time, and mind and body. A lot of people are still chained to evil mentors unawakened. This is really a waste. It is preparation work that you’re offering to Kamidana. 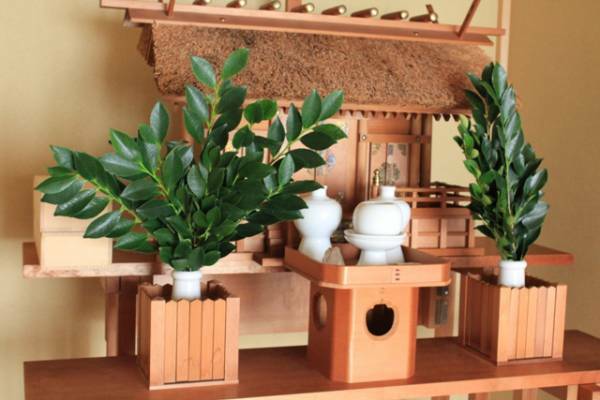 Every day you should change the water in Sakaki stands (Sakaki is a species of evergreen sacred to Shinto), and the water offered to Kamidana, a household shinto altar. If you cannot do it while you’re on vacation or due to holiday plans, you don’t have to change the water. It’s no problem to leave the water as it is. If you stay away from home for more than two weeks, you can throw away the Sakaki plants and the water. Sakaki plants last long during winter, but during summer the part of their roots under water becomes icky and the plants begin to wither because of inability to absorb water. To keep Sakaki plants fresh as long as possible, you should wash off the icky thing around the roots when you change the water everyday. It’s ideal to exchange Sakaki plants for new ones when their leaves begin to fall, but it may be difficult for ordinary homes to exchange them often. If you find some leaves which have turned brown when you change the water, you can tear them off with a hand and throw them away. If you think the volume of the leaves has decreased, you should exchange the whole Sakaki plants. You should throw them away into a trash can with other garbage with gratitude. While you pray in front of the Kamidana, the Sakai plants act as a kind of perch where spirits can stay temporarily. The Sakaki plants put on the right side of the altar are easy to wither. This is because local deities patrolling the region often come to the Sakaki plants to use their vitality and because they attach spiritual dirt of your house to the Sakaki plants. The Sakaki plants on the right side of my Kamidana wither soon during a month when a lot of visitors come to my house. If you put a Kamidana in your house, the most important thing is that you coat the Sakaki plants and water with magnetism of gratitude through the work of changing the water and taking care of the Sakaki plants. In changing the water, you should be calm silent. If you do it thinking like “That’a bother,” “I don’t wanna do this. The water is cold,” “Help me, God” then your negative energy infects the water and Sakaki. If you offer such a thing to the Kamidana, spiritual beings who can tune in to the negative energy can only come close. Obnoxious spirits asking for help will come. As long as you pray to such spiritual beings, nothing will go well with you. That is, if you are not mentally healthy, to put a Kamidana in your house could have adverse effects on you. This is why I strongly recommend that you hold memorial services for your ancestors in the Ise-Hakusan dou way, but I don’t recommend very much that you put a Kamidana in your house. If you’re depressed, you had better not put Kamidana in your house. As the number of wandering spirits related to you decreases in number as the result of holding memorial services for them with gratitude, you will get better gradually, and then, as the next step, you can have a Kamidana in your house. 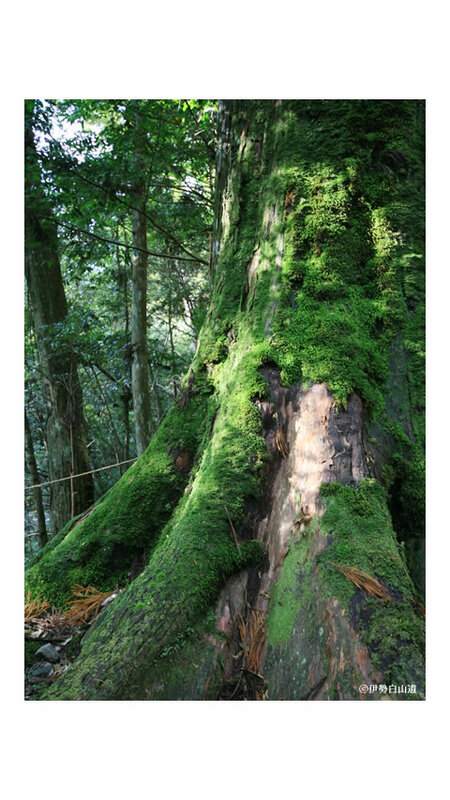 But if you can realize the importance of offering gratitude to a Kamidana in the Ise-Hakusan Dou way, you can both start holding memorial services and put a Kamidana in your house from the beginning. It is the act of exchanging the water before praying that matters most, because when you bow towards the Kamidana, with the water and Sakaki coated with your energy emitted in the preparation work, the content of the energy is reflected on you. So it’s important to do the preparation work with gratitude and offer gratitude toward the Kamidana. When you do so, holy spiritual beings you should be grateful to will come close. You don’t have to think any concrete wishes of yours in front of the Kamidana because you’ll find out that everything is all what you are grateful for. It was when I was a high school student that I, for the fisrst time, was inspired by Kunitokotachiohkami（国常立太神）, or the soul of the earth. At that time the U.S. started to do underground nuclear tests. A day before the test was done secretly, I knew that the test would be done the next day because my body was shivering. Several days after the test, the news was broadcast all over the world. I had been informed of it more than six times in those days. I had been inspired by a lot of sacred spirits since I was a little child, and each of the spirits was distinctive and old and they were all powerful energy bodies. Their spiritual wave motions were of the mix of anger, lamentation and sadness. Underground nuclear tests seemed to be harmful damage to the earth spirit. The earth spirit was deploring all religious organizations of the earth civilization established in the last 6000 years. It was sadness beyond description. Though I have been writing articles unobtrusively to suggest that you keep away from pay healers, psychics and religious groups, the reality is much worse than you can imagine. Sorting out the inspirations I’ve received from this sacred spirit so far, I can say that the money to cause commotions, wars, the development of weapons, nukes, etc. comes from religious organizations, hedge fund groups, nations and those behind the scenes who are in charge of issuing currencies, and that the boss of all these has his headquarter in Europe. Though a collision with an Islamic organization, which were born by a Kenzokushin of Susanoo（スサノオ）, is about to happen, this would be nothing more than a small incident, seen through the eyes of the earth spirit. What this sacred spirit feel sad and is angry about is that the human beings he has nurtured over the past billions of years have been searching the outside of their heart for God and have become vain. This is the root of all evil, he told me. A lot of people have appeared in the past 100 years who tell others that they’re inspired by this sacred spirit, but they’re actually inspired by spiritual beings who have come into this World of Reality escaping from the World of the Dead. They’re false. They’re trying to establish his own religious group telling lies―out of the question. I have once met a man in Showa era who I admitted was sympathizing with the spiritual current of this sacred spirit. He had an international patent on a pharmaceutical product and lived free from worldly cares without working. He passed away without showing the will of this spirit to this world. People, becoming too rich, might have an inclination to stand aloof of trivialities of life. I came across this person strangely and kept in touch with him for about two years. The content of the will he received from this sacred spirit was exactly the same as mine. That is, each of us had better be as spiritually light as possible by holding memorial services for ancestors in the right way. The sacred spirit told me that he would have no mercy on all things that make humans vain such as conventional religions or organizations to squeeze money out of people and make people dependent on them. The earth and nature are about to move. Ubusuka-kami develops and changes in the course of your life. A local deity of where women give birth to their children is called Ubusuna-kami（産土神）. Macroscopically, Ubusuna-kamis fall into two groups: one is a group of Amaterasuohomikami（天照太御神 ）and the other is one of Kunitokotachiohkami（国常立太神）. All deities arise from the Original God to make a pyramidal structure, and the two deities are like the first ones to branch off. Deities of the group of Amaterasuohomikami have agrarian, cooperative characteristics such as maternity, kindness, ladylike, and community-rooted activity. On the other hand, deities of that of Kunitokotachiohkami have independent characteristics such as the willingness to make it clear whether something is right or wrong, the search after truth, stubbornness, fondness of travel without settling down. Your characteristics as a child were affected to some extent by which line your Ubusuna-kami belonged to, to be sure, but it’s not what you have to worry about. Because Ubusuna-kami（＝Inner God）develops and changes depending on how you live and what you believe. This is a grace of God allowed only in the World of Reality. The first Ubusuna-kami as you were born is only the beginning of your Inner God. Even if the holy energy you used when you came into this world had been the energy of a high ranked spirit, it doesn’t matter. Your Inner God has developed since you came into this world. That your Ubusukanakmi was a high ranked spirit doesn’t mean that you can live your life easily for the rest of your life. Unfortunately, a lot of people live their lives in such a way that their Inner God is replaced with another low-level being. If your Ubusuna-kami belonged to the group of Kunitokotachiohkami, it’s better to worship Amaterasuohomikami in this World of Reality. As you have the right faith, your Inner God will come to be replaced with a deity of the group of Amaterasuohomikami. Kurozumi Munetada（黒住宗忠), one of the greatest Shintoists in Edo period, asserted that Amaterasuohomikami is the only deity that is really free of trick. The faith is wrong which leads you to unhappiness in the long run. Even if a doctrine says that its purpose is to make your soul develop or ascetic practices are important, it’s like fake stoicism which makes your present situations worse. There must be something wrong in the faith. Evil spirits who pretend to be Amaterasuohomikami are comparatively small in number, for the name itself has a great purification power. As I do some spiritual reading about other names of deities than Amaterasuohomikami, I often find out a lot of spiritual beings of the World of the Dead who pass by the name of false names. Once you were born into this world, what’s important is now and the future. What matters most is reminding yourself of gratitude everyday, having the right faith, and making efforts to live.